The HyperX Quadcast is an ultra-credible USB mic that takes aim at other units in the sub-$200 price range. Despite its technical limitations, it can credibly record a podcast, stream, or other vocal-centric application short of professional recording. The red lights also make it abundantly clear when you're live, and when you're not. Gaming peripherals have had one hell of a renaissance with the growing popularity of streaming. While it is true that most gamer-centric accessories bear some sort of obnoxious or 90s-esque extreme branding, the fact of the matter is this segment has matured into its own beast. People want gaming headsets and mics to become the next big thing on Twitch. However, headset mics just aren’t good enough to keep an audience happy, especially given their penchant to sound a little less-than-professional. As your audience grows, the less you can get away with a crappy system. The answer is to get an actual standalone mic. What is it like to use the HyperX Quadcast? Like most USB condenser microphones, the HyperX Quadcast is very easy to set up—and a little difficult to get exactly right. By that I mean: you won’t run into trouble on setup, but you’ll find that your gaming station may end up being a pain to reconfigure so the microphone doesn’t pick up your screaming graphics card when you run Overwatch on Ultra settings. It’s a problem all condenser mics have, so don’t worry too much. On the top of the capsule is a mute toggle—which will also turn off the lights behind the grill. The microphone looks a lot like a hairbrush sans-bristles, and it’s held up on a tilting stand with a rather robust dual-shock mount. On the bottom of the capsule is a gain dial to increase or decrease the sensitivity, and on the back is a knob to swap your pickup pattern. If you don’t know what to do with it, we can help you out below. When you first plug in the microphone, both the sound output and the microphone input will default to the Quadcast on your computer. That’s because there’s a 3.5mm headphone jack on the back of the unit that you can pass your computer’s output through. You’ll probably want to use your own setup, but the option exists if you want it. The gain knob on the bottom of the capsule is very intuitive. If you’re living with family or roommates, a dedicated mute touchpad on the top is a godsend. Just tap to toggle the mute function, that’s it. Additionally, the microphone has lighting behind the grill—so you’ll never speak on a hot mic without getting an ultra-visible reminder that you’re live to the world. Do you need a pop filter with the HyperX Quadcast? You don’t need to be very close to the mic, though it helps to be within 14 inches. You do not need a pop filter with the HyperX Quadcast. There’s a foam-like material immediately beyond the grill that does a decent job of breaking up the pressure spikes associated with plosive sounds (p, pf, etc.) that can make really distracting loudness spikes or damage more delicate mics. What is the HyperX Quadcast compatible with? Even if you’re not streaming, wanting a better microphone to play with is only natural. The HyperX Quadcast is compatible with Xbox, PS4, PC, and Mac systems via the USB cable. The miniUSB and 3.5mm headphone ports. What are the best settings for the HyperX Quadcast? Just like any product, there’s no one best set of settings, but there are a few best practices you should follow with any standalone mic. For example, condenser microphones don’t need a dedicated interface to work. They are much more sensitive to sound than, say, dynamic microphones like the Shure SM58—so they’ll pick up just about everything around you. The polar pattern knob allows for four separate pickup patterns. In that case, you’re going to want to turn down the gain as much as you can while still being heard. You’ll also want to bring the microphone closer to you and away from anything that could reflect sound back towards the microphone to avoid echoes. But what about the polar pattern knob on the back? For podcasting or streaming purposes: stick with the cardioid (heart-shaped) pattern. The reason for this is that this pickup pattern will be the best-suited to recording a person speaking while minimizing the noise and echoes of the room around them. 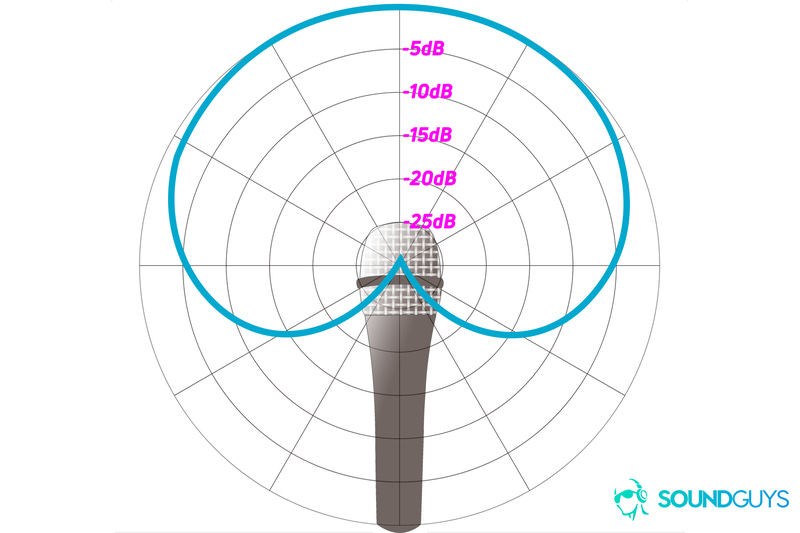 By sticking with the cardioid pattern, you’re preventing echoes from your computer monitor or office wall from reaching the mic as much as can be reasonably expected by a feature such as this. Is the HyperX Quadcast any good? Here’s the sticky part of the review where we’d normally ask you to take our word on something. But instead of doing that, we’re going to show you as much as we can. Above is a sample audio clip captured with the HyperX Quadcast. You can tell there’s a little bit of proximity effect going on, but overall, the quality is pretty decent—definitely good enough to stream or podcast with. Of course, you’ll get better results with a treated room, interface, the whole nine yards—but you’ll get a very solid recording with a fraction of the bill or frustration associated with a professional setup. In our testing, we found that this mic bumps sibilant sounds (f, s, sh, etc) a bit over most other voice sounds, so you may want to either step back from the mic a bit, or see if you can reduce that band in post-processing if you’re podcasting. I myself have issues with this, so I typically drop everything over 4kHz 10-30dB depending on the recording with a different microphone. Like most microphones used over USB, there are certain realities you’re dealing with where quality is concerned. However, considering that many YouTubers still use USB microphones to do voiceover, just be aware that you don’t need a Shure SM7B to get usable results online. Chances are, the bitrates people are going to have to suffer through are going to prevent you from hearing a huge difference at the end of the day, and that’s why USB microphones are so common in the streaming scene. Just be sure to manage your environment, and the HyperX Quadcast is a credible USB mic for purposes that don’t include serious music production. Should you buy the HyperX Quadcast? The HyperX Quadcast launched on March 25th, 2019 for $139.99, and it’ll be a while before it goes on sale for less. However, it’s definitely worth the money if you want a solid microphone for the computer that sounds great without too much fuss. Of course, investing in a proper setup and room treatment will net you better results, but the Quadcast represents a point of diminishing returns. We strongly recommend this product for streamers, podcasters, and anyone that wants a step up in mic quality, but can’t commit to a dedicated recording station.